Remember the 5th of November! Feel like a real-life revolutionary! Imagine yourself in dystopia, where the government controls your every move. Could you lead the revolution like V did in the action thriller V for Vendetta? Well, you can start by wearing his mask. Made to resemble the historical figure Guy Fawkes, this plastic cover-up features a mustache and goatee. It comes in a standard size and will make you feel like a real-life revolutionary! Includes mask only. Hat, wig, and armed uprising not included. "People should not be afraid of their governments. Governments should be afraid of their people!" All hope was lost. Then one person, one man, dared to stand up and lead an entire revolution. 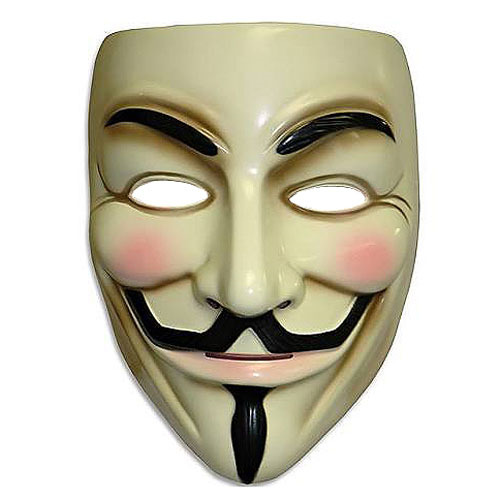 His name was V. In honor of V, always remember the 5th of November!